As you have heard by now a newly announced junior college (JC) has caused much public interest online. ‘Eunoia Junior College’. But how do you pronounce it? The firm favourite is number 2. you-noy-uh. Which can also be used on people when you find them annoying. Names can have different pronunciations in Singapore. For example the names ‘Aloysius’ and ‘Joel’. For more take a look at this post. Recently the MOE have said that it is pronounced ‘yoo-noh-iea’. 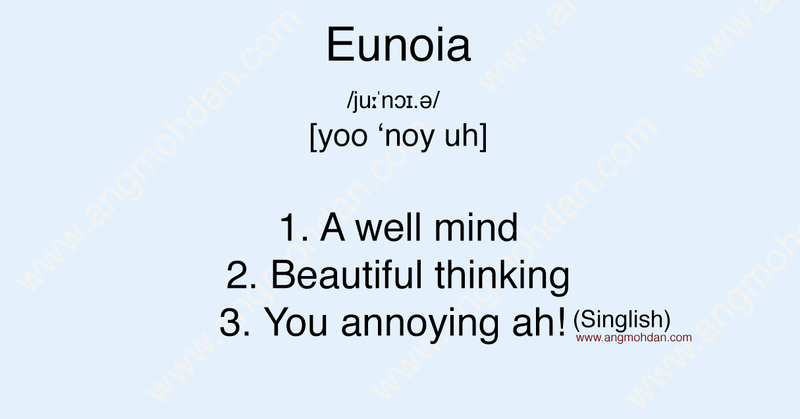 From Ancient Greek εὔνοια (eunoia, “goodwill”, literally “beautiful thinking”), from εὖ (eu, “well, good”) + νόος (noos, “mind, spirit”). We will have to wait and see how the name will be pronounced across Singapore. What do you think?